This picture is the only photo existing of the joint staffs of the National 4-H Service Committee and National 4-H Foundation during their merger as National 4-H Council. It was taken at the National 4-H Center (which was being remodeled) in 1976, 48 years ago, a year before merger. Can you help us identify the “blanks in the photo? L. to R. Seated: Louise Kilpatrick, Margo Tyler, Harold Sweet, Mollie Hardin, Gary Deverman, Mary Bedford, Melvin Thompson, Nancy Aiken Varian, Gwen El Sawi, Lois Howard. L. to R. Standing: – ________, James Veeder, Francis Pressley, Bonnie (Beck) Sarkett, Jack Seibert, Kathleen Flom, John Pederson, ________, Larry Hancock, Charles Freeman, Larry Krug, James Harden, Wayne Bath, Les Nichols, Joseph McAuliffe, ________, Marsha Midgley, Grant Shrum, ________, Kenneth Anderson, Pat Brown, Ray Crabbs, Diana Williams, Don Henderson. Please note: Not all current staff at the time are shown in this photo. 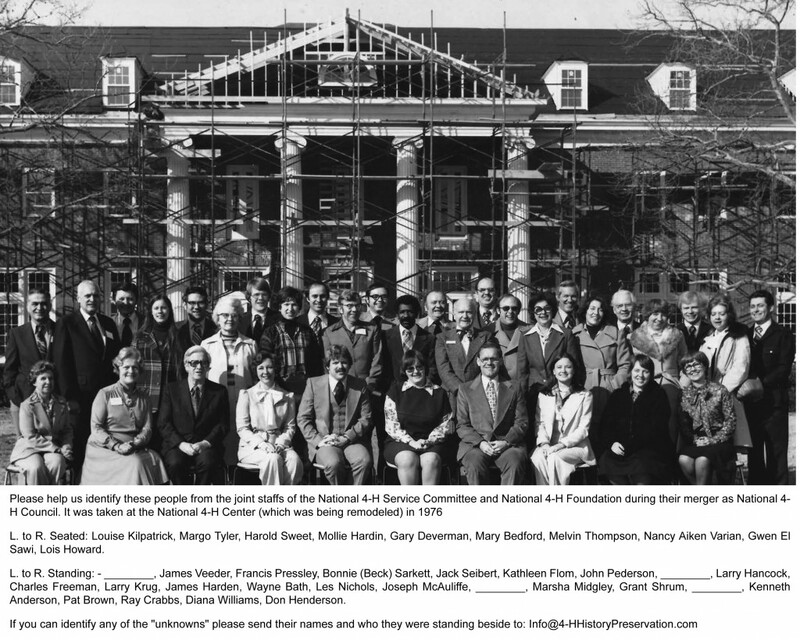 This entry was posted in History and tagged 4-H History, Can You Identify, National 4-H Foundation, National 4-H Service Committee by Larry Krug. Bookmark the permalink.